Interstate 69C south at Interstate 2. Photo taken by Jeff Royston (08/21/13). Interstate 2 was designated in 2013 to serve the Lower Rio Grande Valley (RGV) in south Texas. 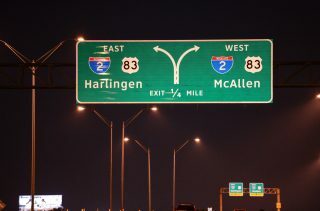 Until the establishment of I-41 in 2015, it was the newest 2-digit Interstate in the system. 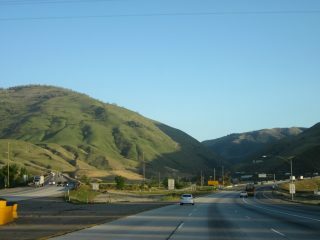 Interstate 5 south at Grapevine, California. Photo taken 04/09/12. Interstate 5 leaves the Central Valley and climbs to a high point of 4,144 feet across Tejon Pass near Gorman. South from there the freeway lowers into Los Angeles.